For those of us who aren’t lucky enough to have the space for a dressing room or walk in closet, making effective use of the closet space you have is essential. Who wants to spend time digging through things to access the buried treasure? Or worse, discovering clothes that we didn’t know we had that are out of date but still have the tags on them. Builder-grade closets like mine come with one bar, one shelf, and doors that leave a lot to be desired. If you’re like me, a time comes when you need to roll up your sleeves and fix the problem! 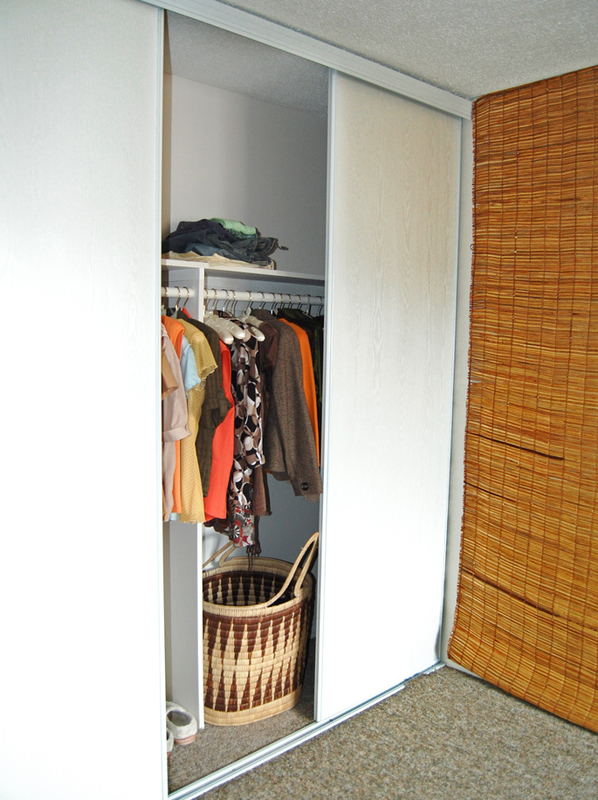 Now that our bedroom is looking more comfortable, it’s time we turned our attention to the closet. It would be easy to give up just because I can’t have a massive dressing room – the kind of thing I see on Pinterest all the time. You know what I’m talking about: the boutique-in-your-bedroom experience; the magical doorway to fashion Narnia in your own home. But design is about solving problems and making things more functional as well as more visually appealing. There’s no better way to work your design muscles than to have some constraints! In a spirit of total pluckiness and gumption, I am determined to take what I’ve got and make it awesome! As you can see, our bedroom closet leaves a lot to be desired. There’s a lot of wasted space. At about 7 feet wide, it sounds like there’s more room than there is. There is also an awful scraping sound as the warped doors grind past each other whenever I try to get in there, but that’s another story. The sliding doors seem like a good idea until you actually try to find your clothing, and realize you can’t see what you’ve got to work with. I know, I know! Sad, eh? My laundry basket’s pretty cool though. Know what you want to store. Before you start thinking about what your new closet will look like, make a list of all clothing and accessory types you plan to store. Everyone remembers the shirts and pants, but what about hats, bags, shoes, scarves, ties, and jewellery? Do any of these need storage space in your closet? Play Tetris, and group by shape. Thing about the space your clothing types will occupy: tall, short, small, foldable, etc.. Group the shapes together to create larger building blocks. For example long dresses and pants that need to be hung up full length (not folded) can go together. Make sure everything is visible. If it’s hidden, you’re not going to use it, or you’ll waste time finding it. The more often you use it, the more accessible it needs to be. Think vertical: what needs to be at arms’ reach? What do you use only once or twice a year and can go on a shelf at the very top? Know your habits. Do you need to check your look in a mirror before you can leave the room? Maybe a mirror behind a door is the answer. What about activities like ironing? Do you need a system for sorting clothes that have been worn once, but don’t need to be laundered yet? Know how clothes should be stored. Are you hanging up knitwear that should really be folded? (Guilty!) Maybe a set of drawers in the closet is a good idea. You paid good money for your clothes, and storing them correctly can extend their lifespan. Some items like dresses should hang to minimize wrinkling, but other things like jeans can be folded. Consider alternate storage. Would a dresser, armoire, or chest work in your room to add to the storage space you have available? Curate your wardrobe. Avoid impulse purchases – only buy perfect pieces that your love. One staggeringly inspiring post on Gardenista shows how to get a whole season’s worth of looks out of 10 items of clothing! Ten pieces! I am still freaking out over this. (Deep breath) to summarize: be ruthless about junking clothes you don’t wear. Think about lighting and airflow. 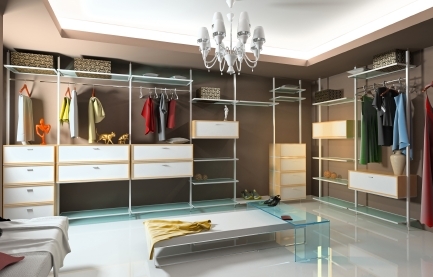 Good lighting helps you find things, and airflow helps prevent mould and insects (hat tip on this point: This Old House’s “The Principles of Smart Closet Design”). Having a well-organized closet can encourage you to put things back where they belong, and avoid that dreaded crumpled mass on the floor or a shelf! There’s no room for my husband’s clothes! We need to make room so we can get them out of the second bedroom (currently our office). He has a hanging caddy for things like t-shirts and socks that will need to fit. I have some taller items like long dresses and skirts. This means I can’t have double bars the whole width of the closet. The sliding doors are so flimsy that the cats can get into the closet themselves. It was funny and cute until I had to clean the cat hair off of everything. Our wonderful plan! It’s to scale, so you can see the kind of proportions I’m working with. Moving the top clothes rail up a little higher will make more room for a second bar underneath. Moving the laundry basket out of the closet will make better use of space. 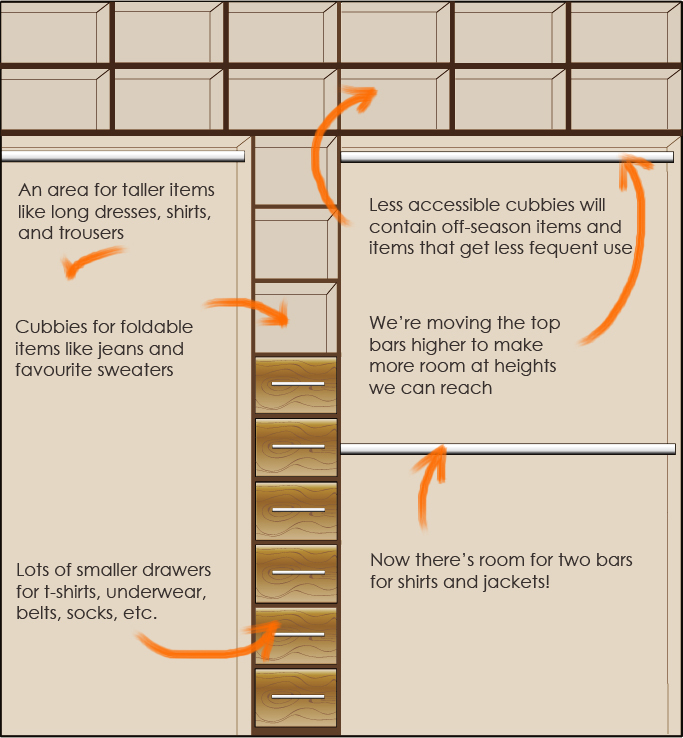 Adding a set of drawers and cubbies for things that need to be easily accessible will help. I don’t have an exciting shoe collection, so we don’t need to make room for them in the closet. I have a thing about shoes in the house anyways (yes, I’m one of those). Having an extra set of cubbies up top will help with things like bags and items we don’t need as often. In the next few weeks we’re going to start building, so stay tuned! In the meantime, do you have any helpful hints to share? It’s not too late – save me from myself if you think I’m making a terrible mistake!